Are you in Lagos on the 24th and 25th of March? Are you a bride getting married soon? Then the Wed Expo is for you. 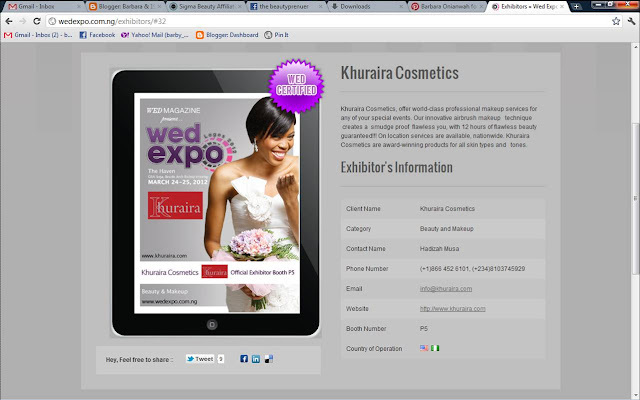 The best part is that one of Nigeria's makeup brands that has won several awards and had 5 star product reviews will be there and that is Khuraira Cosmetics. So be sure to come by the stand. I will be there too and will be looking forward to meeting all my blog readers and taking pictures with you all. Barbara: Longest time, abi? I haven't heard of Khuraira Cosmetics o, but I will check it out, thanks to your recommendation. Unfortunately, I won't be there, but I will look out for the pictures. Yes dear, longest time indeed. How have you been? Iv done a couple of reviews and makeovers with the Khuraira products in earlier posts. You really should try them out especially the concealers.